During this workshop we will investigate the concept of resilience by returning to the primordial idea of the enclosure, which protects and gives form to a space. Resilience implies both persistence and change: two seemingly opposing concepts, which are embodied in architecture by both structure and cladding. This distinction is perhaps most famously illustrated by Semper’s thoughts on the origins of architecture. According to Semper, the true and legitimate representation of the idea of enclosure was originally enacted by woven fabrics. First there is cladding, a building’s dress, second there is solid wall or structure to hold it up. Besides providing protection and shelter, cladding is by necessity representational. It forms a buildings face and is the visible, colorful, and sensible – in a word symbolic – boundary of space. It can be described as a discourse predicated on the surface. Making and consequentially thinking though making, will play a central role in the workshop. Over the course of a week we will focus on the technique of casting. We will study the work of artists in the likes of Rachel Whiteread, Isamu Noguchi, and Ben Nicholson. 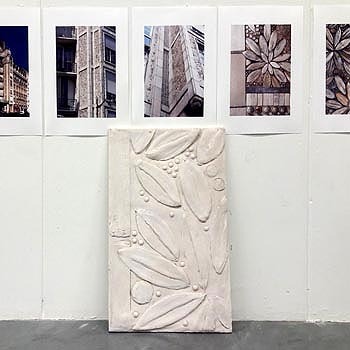 By pressing, casting, scraping, by the act of making, we will work collaboratively to produce a set of life size cladding tiles: a hands-on experiment in texture, scale and shape and an investigation on the symbolic and representational potential of cladding.